Not only Robinson. The narrator is in ruins too. The ruined voice of a ruined Left, Vanessa Redgrave crumbles the commentary over Patrick Keiller’s images in this third and final-feeling instalment of the Robinson films, following ‘London’ and ‘Robinson in Space’. The sense of a project, a journey and a ‘great work’ that pervades the first two films has faded to nothing, but the camera is still running. Robinson is released from prison, sentenced for crimes committed during the making of the second film. He emerges profoundly alone. Where before he was a social loner, he had nevertheless developed an anti-social belonging through something like the ‘drift’ or ‘dérive’ of the International Lettristes, wandering with his narrator and former lover, occasionally encountering others such as travelling musicians or the bowler-hatted, conspiracy-obsessed ‘man of the crowd’. But now in ruins, Robinson’s drift is an ascetic, analytical one. All resistance is eighteenth century. The narration and narrator are dislocated from the journey; just the speaking of documentation. There is little here that romanticises the analytical anger and it strings along, never quite attaching itself to the neck of anything. Its visual romanticism must stand its own ground; the vibrant materials of the fields, the effects of the breeze, the routine of the giant agricultural machines – vital objects startled within the familiar compositions, tempos and framings of Keiller’s cinematography. Gone is the optimism, the experiment and playfulness. Doreen Massey (one of Keiller’s collaborators on the project of which this latest film is a manifestation) makes it clear that Keiller does not see himself as any kind of a psychogeographer. Though psychogeographers of various stripes have drawn ideas and momentum from his first two Robinson films. Without the hint of an occult, we are left with backstory. There are no IRA bombs, no cranky reactionaries, no ‘wandering bishops’, no collective drift. Robinson has been ruined by his confinement. The camera moves from place to place, the movie shot in the sequence it is filmed, but it is only its description of a troubled and triumphantly surviving capital that is dynamic. That has roots. Where once the stillness of the camera shots emphasised the journey of Robinson and pals, now it is the spectacle of production and distribution that has the force of trajectory. Neo-romantic symbolism is replaced by the look and life of things. A botanising of the streets become a botanised economy. 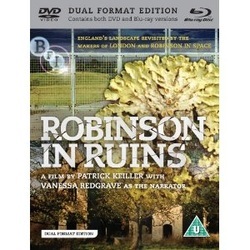 But Robinson In Ruins is well worth the watching. It is steeling. For the best of reasons it brings the radical pilgrim’s progress along the road from The Redoubt of Voluntarism in a tragic search for The Determinist Motor – the bitterest irony of this impressive machine is that the nearer one gets to it, the less helpful it is. Like a final zombie, becalmed in a field, when the living have all been eaten, or a heist movie in which all the characters are already rich – what is in ruins is the radical narrative. Recourse to philosophy cannot save it now. This movie begins with the perfect outcome - survival beyond death (crisis). This is the afterlife, capitalism-style. It’s really ‘Robinson In Hell’ and it packs the force of a dark canto. Formalist, self-denying, its anti-multiplicitous, anti-psychogeographical elegance making for a coruscating viewing, awful in the best sense, Robinson In Ruins is a must-see, not because it delivers some other thing (pleasure, suspense, poetry, transformation) but for its refusal to deliver anything but its own necessity. ‘We’ (because there is no ‘we’ in ‘Robinson’ anymore) need this film.